"Success is inevitable when God is your top priority!" 25 grams of protein per serving! Jay Robb uses the highest grade of whey protein possible when creating the best-tasting whey protein powder. This unique process also yields a whey protein isolate that is much higher in protein than a whey protein concentrate and is also rich in immunoglobulins, alpha-lactalbumin, and beta-lactoalbumin and other immune boosting factors. 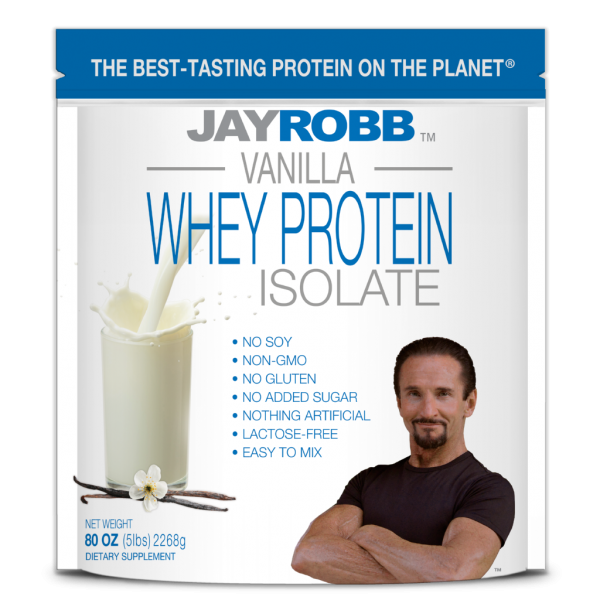 Jay Robb Non-GMO Whey Protein Isolate powders are made from the finest natural ingredients available. Only cold-processed cross-flow microfiltered whey protein isolate is used as the protein source and this material comes from farm-raised, pasture-grazed, grass-fed cows not treated with the synthetic bovine growth hormone rBGH*. One taste of our easy-to-mix delicious Jay Robb Non-GMO Whey Protein Isolate powders, and you’ll be a fan for life! Jay Robb is going green and is now selling re-sealable bags for all sizes of our whey protein powder. If you still prefer to store your protein powder in a canister then please purchase our empty 24 oz re-fill canister (see below). Thank you for supporting our steps towards improving our environment. *Because rBGH-free whey is primarily obtained from small farms throughout the world, there is only a limited supply. The Jay Robb Corporation secures large quantities abroad each year to meet our growing needs; however, there are times when the world supply runs short. During these periods, we may choose to procure the highest quality domestic whey protein in conjunction with rBGH-free raw materials to produce our world-class whey protein. Vanilla: Whey protein isolate, Natural flavors, Sunflower lecithin, Xanthan gum, and Stevia leaf extract (Rebaudioside A). Chocolate: Whey protein isolate, Cocoa, Natural flavors, Sunflower lecithin, Xanthan gum, and Stevia leaf extract (Rebaudioside A). Strawberry: Whey protein isolate, Natural flavors, Sunflower lecithin, Xanthan gum, Stevia leaf extract (Rebaudioside A), and Red Beet (for color). Contains: Milk, This product is processed in a facility that also processes Milk, Soy, Egg, Wheat, Tree Nuts. I don’t believe in diseases. I believe most diseases are merely toxic reactions—manifesting as symptoms—from being exposed to a wide variety of mental, physical, and spiritual toxins. If you feel tired, weary, or sick and are looking to get in your best shape ever and live life to its fullest, then join me now on this incredible journey. Sign up for my newsletter and special offers!